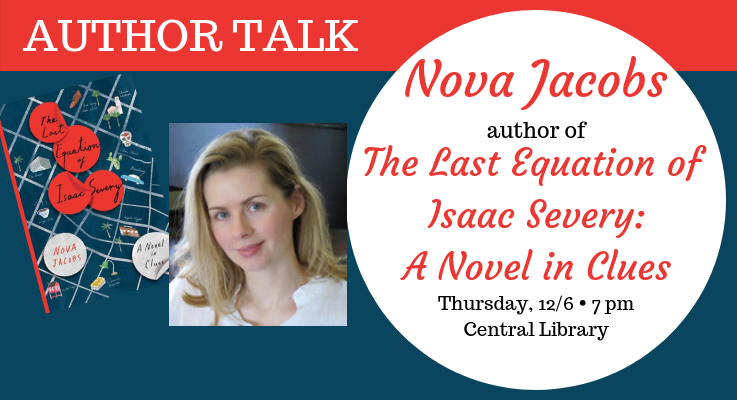 Don’t miss a very special author talk where Nova Jacobs joins Anne Louise Bannon, president of Mystery Writers of America, Southern California. in conversation as they discuss her book, The Last Equation of Isaac Severy: A Novel in Clues. The discussion will be at the Central Library on Thursday, December 12th at 7 p.m. Books will be available for sale and signing. Jacobs’ debut novel is at once a dazzling and imaginative literary mystery and an immensely satisfying family drama. A legendary mathematician leaves his final equation to his adopted granddaughter in a series of confounding clues concealed inside her favorite novel. The problem is, she can’t decipher where the equation is hidden—or why she has been entrusted with such a weighty secret. For more puzzling novels full of clues, ciphers, and mystery, take a look at the list below and immerse yourself in another literary puzzle. Alice-slight introvert, crossword compositor- works at PopCo, a globally successful and slightly sinister toy company. Lured by their CEO to a Thought Camp out on the moors, PopCo’s creatives must invent the ultimate product for teenage girls. Meanwhile, Alice receives bizarre, encrypted messages she suspects relate to her grandfather’s decoding of a centuries-old manuscript that many-including her long-disappeared father-believe leads to buried treasure. Its key, she’s sure, is engraved on the necklace she’s been wearing since she was ten. Using the skills she learned from her grandparents and teaching us aspects of cryptanalysis, Alice discovers the source of these creepy codes. Will this lead her to the mysterious treasure or another, even more carefully guarded secret?